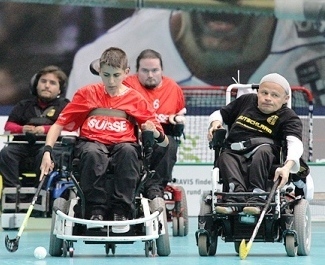 Powerchair Hockey (Floorball) is a sport for people in motorised wheelchairs. IPCH is played on an area approximately the size of a basketball court with a surrounding barrier. The barrier is used during play to rebound the ball. PCH belongs to the sport section of the International Wheelchair & Amputee Sports Federation, IWAS, and ICPH is the International head organisation of floorball/hockey played with electric wheelchairs. Five players are on the court at any one time but a team may have two or three substitute players. A team should have two players with ’T – Sticks‘ (a T shaped stick attached to the wheelchair itself) but at least one must be the goalie. Watch IPCH action from the IFF Youtube channel.